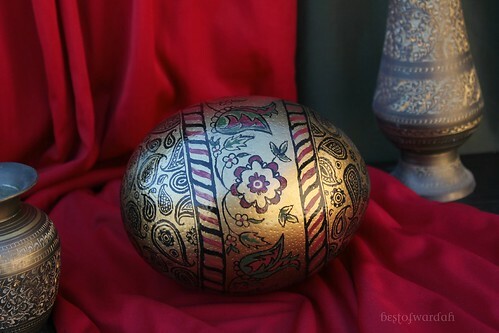 The third ostrich egg I painted was a present for my parents. They recently celebrated their 20th wedding anniversary. My mother requested that I paint her an ostrich egg for our living room. I wasn't able to complete it by their anniversary, but she loved it just as much. This egg has a very different image from the other two. The metallic gold background gives it a very sophisticated look. This is perfect for where it sits right now: our living room. The inspiration for the center stripe of the egg came from the carpet in our living room. 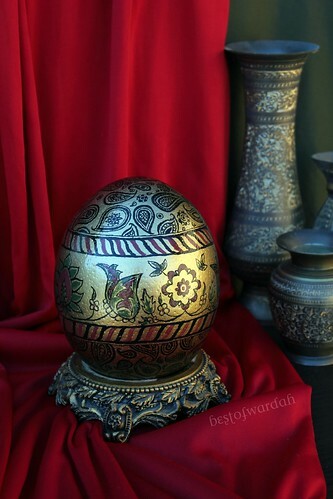 The border on the carpet is very exquisite, so I figured that incorporating these colors and style onto the egg would help tie it all in together. 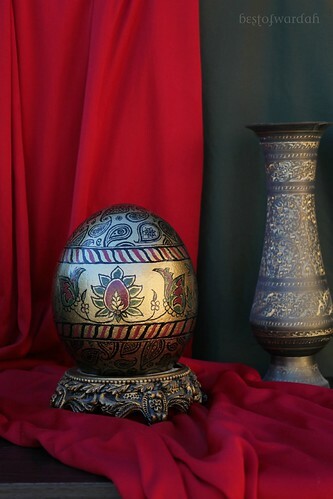 The black patterns on the top and bottom of the egg are done freehand. A lesser-known fact about me is that I am a henna artist. I have been henna-tattooing since I was 8 years old. 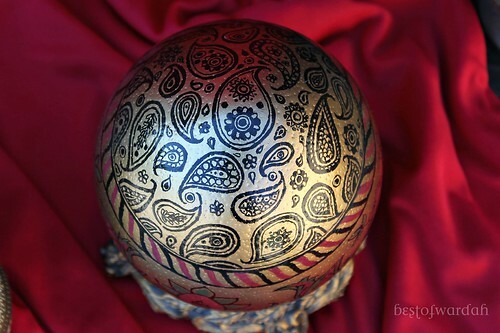 The designs on this egg came from the many different types of henna tattoos I've done. Similar paisley designs are common in traditional henna art. On a side note, some of you have been wondering how exactly I start painting an egg. I took a couple of in-process pictures of this egg to show you all how it's done (or at least how I do it). I start with a clean, hollowed-out ostrich egg. These babies are big: 16"-18" around their length and 14"-15" around their width! 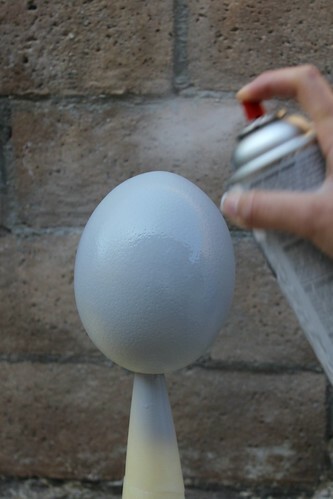 First, I take it outside and spray paint a base coat of gray on it. This allows me to prep the egg and gives me a neutral color to contrast my highlights and shadows to. The next step is to paint the egg. 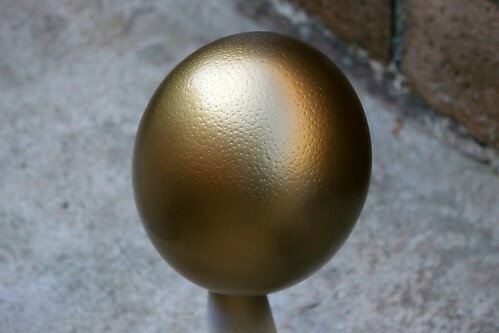 In this case, I began by spray-painting this brilliant gold onto the egg. From there, I sketched basic lines to indicate where I would paint the next band. Then, I freehanded the rest of the patterns. Finally, I varnished the egg with a few coats of lacquer to give it a polished look. 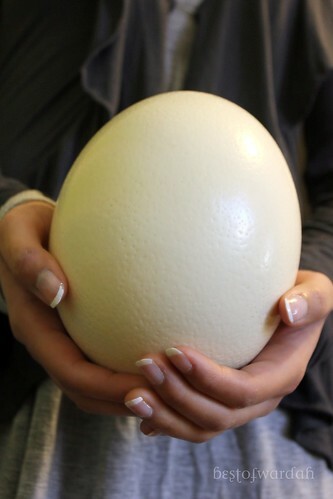 As usual, don't forget to email me at warif93@gmail.com if you interested in purchasing an ostrich egg of your own! Assalaamu Alaikum! You are crazy talented Masha Allah! I have an additional question about how you paint the ostrich eggs (although you've explained the process wonderfully! ), as well as how you painted that gorgeous Paris/imaginary backdrop. For either of these types of projects, do you sketch with a pencil first, to be sure you don't make any potential mistakes when you actually start painting (for both the eggs and cityscape)? Did you use a ruler (for the cityscape) to create straight lines, and a compass or anything with a rounded edge to assist in creating those beautiful bands around the eggs? Or, do you freehand everything? I'm taking a pottery class which starts next week and can't wait to get started with decorating/painting. Thanks for sharing these beautiful pieces! Wasalam Sarah! Jazakallah for your very sweet comments. First, let me tell you that I do sketch with pencil to create a basic outline. Using a ruler depends largely on what surface you're working on and what object you are creating. For example, on the eggs, to create straight lines, I would use a measuring tape (because they are flexible) and put a series of dots a certain distance from the exact center on the top of the egg. Then I just sketch dot-to-dot to create the full line. However, in the case of the cityscape, I used a ruler to create the outside edge of the buildings. I also sketched the Eiffel tower because, like you said, I didn't want to make any mistakes. The rest of the detail, windows, pots, signs, etc., is freehand.